In a bowl add the onion, meat mixture, ketchup, minced garlic, adobo mix, and paprika, cumin and work the ingredients together with your hands until combined. Cover with foil or plastic wrap and refrigerate for 45 minutes to allow the flavors to marry. Form the mixture into four 4 oz. patties. Heat the olive oil in a large skillet over medium heat. Add the burgers and brown them on each side, flipping once, 5 to 7 minutes. 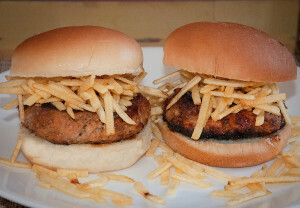 Set the fritas on the bottom side of the bun and top the burgers with ketchup. Add a handful of potato sticks then cover with the top of the bun and serve.